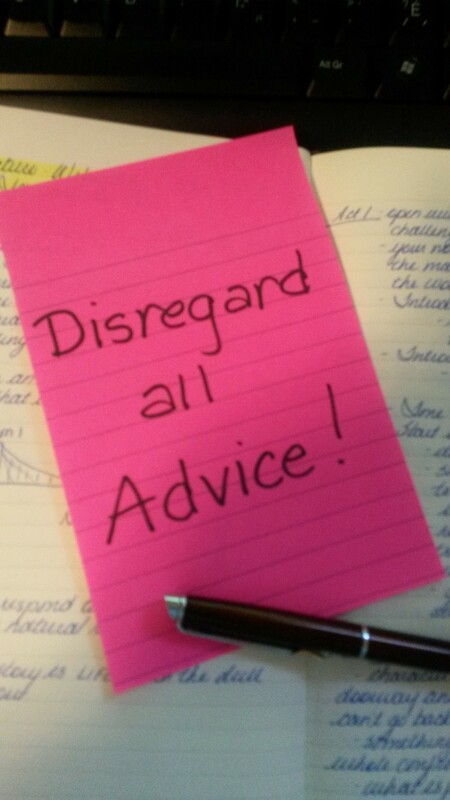 In this first blog post of 2014, I challenge you with this: DISREGARD ALL ADVICE! Now, before you come after me with spitballs, allow me to explain. Writers, like all artists, break the rules. They write when they feel like it. They lock away their unfinished novels for years without submitting them for publication. They write for themselves. Writers become great writers when they learn the rules, and then, once mastered, they disregard everything they ever learned and write from the deep rumblings of their hearts. So, politely ignore the suggestions, the hints, the advice from the infinite number of sources out there and go with the story that’s been waiting inside you. No one else can tell it. “There are no rules except those you create, page by page.” It’s by writer Stuart Woods, and it’s really made a difference in how I look at my own writing. Advice/rules are just one more thing to get in the way of expressing ourselves fully and freely. Agreed. And I love the Stuart Woods quote!